Things are pretty different here in Nepal, as anyone regularly reading this blog or living here will know already. So many concepts are new, and so many things we take for granted in the West don’t exist, or exist in a new or developing form: TV, Nepali cinema, even the internet is only available to about 17% of the country. 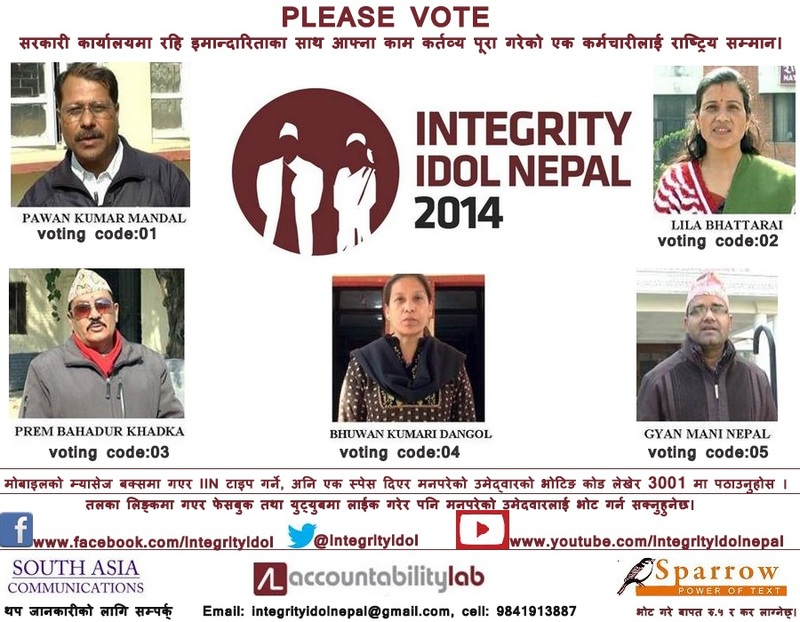 So, unless Nepalis have seen reality TV on Indian television, many may not be aware of the “Idol” phenomenon or even the reality show genre that has taken over television in many other places worldwide. There’s no glitzy “next big star” contest here, but a new type of idol show has taken off in Nepal, which has caught the attention of the international press…in a good way. (This is welcome news, especially lately, when the only international coverage for Nepal has been deadly avalanches, festivals with barbaric animal sacrifices, and embarrassing chair-throwing tantrums in the Nepali Constitutional Assembly.) This is a simple, reality TV-style competition where viewers vote for a winner that demonstrates outstanding integrity in his/her civic job. Its been enormously successful with Nepali audiences, who are clearly eager to see positive examples of how local government can be done right in a country that’s crippled by corruption. Integrity Idol does sound a little absurd–like something from a Monty Python skit, perhaps–but if you’ve seen the effects of corruption or misgovernment first-hand in a place that has little in the way of positive civic role models, its easy to see why its had such an impact. No-one explained to me what the winner received. I trust it wasn’t a cash prize. This is awesome! It’s sweet, noble, and hilarious all at the same time.